The sub-regional economic bloc, Ecowas, says it is now using social media platforms to reach a wider audience, increase awareness among Ecowas citizens and to attain regional integration. For the first time since the Ecowas Commission was established in 1975, in April 2015 it opened accounts on Facebook (Ecowas_Cedeao), Twitter (@ecowas_cedeao), and YouTube (ECOWAS_CEDEAO). The Commission also uses parallel media – print media, broadcast and online media simultaneously – to work towards achieving an “Ecowas of the People” and Vision 2020, the director of the Communication’s Directorate, Sandra Oulate F. Elleingand said. “We are now using the social media because it is “the fastest growing means of communication in the world,” she said of ‘the Role of the Communications Directorate in Creating Awareness among the Citizens of the Ecowas Community’. Last week, she told young West African journalists in Abuja, Nigeria who gathered at the Ecowas Commission for a week, that the Commission is now more accessible to citizens of West Africa and the world and as part of ongoing efforts to enhance visibility of Ecowas, the protocols, programmes and other activities of the organisation are now readily available. Elleingand said information regarding recruitment, procurement as well as political, social and economic activities are featured on the social media, in addition to the new improved website – www.ecowas.int – lunched last year. The site attracted 49, 000 visitors between 23 April and 23 May, 2016, according to the statistics of Google Analytics. “These will bring Ecowas closer to its citizens, allowing them to interact and engage the organisation through comments and sharing of information,” she said. Besides using the internet, Ecowas also plans to use young journalists to promote and attain regional integration. 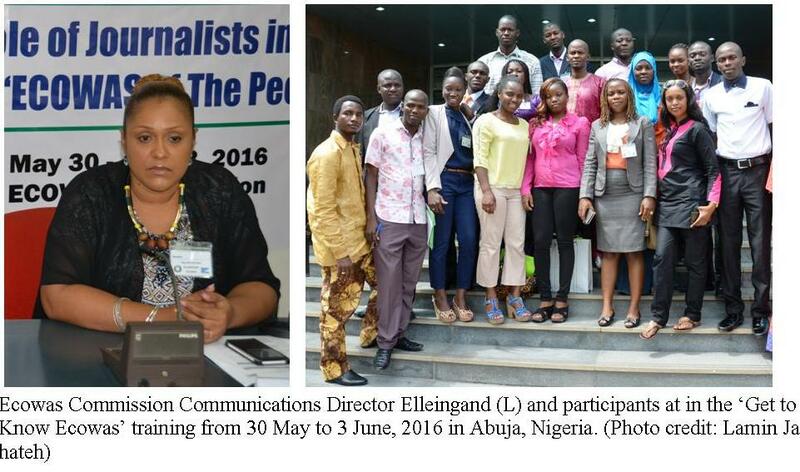 Fifteen journalists participated in the ‘Get to Know Ecowas’ training from 30 May to 3 June, 2016 in Abuja – meant to create a pool of well-informed media practitioners who would act as catalysts to bridge the information and awareness gap between Ecowas and its citizens. The training is meant to equip the young journalists about the operations of Ecowas and its challenges so as to be able to trigger intensive discussions at their various countries leading to innovative suggestions for addressing some of the challenges and the achievement of ‘Ecowas of the People’. Seija Sturies, the resident representative of the Friedrich Ebert Stiftung (FES) Nigeria, said West Africans deserve to know the Ecowas policies and programmes and as well deserve to have a platform to contribute to the decisions of the Commission that directly affect them. She said making certain information like the Protocol on Free Movement of Goods, Persons and Services available to traders who operate across the border can help change some of the practices, and facilitate and accelerate regional integration and development.